Building on 50 years of expertise, JCB’s new generation 67c are the strongest, most high-performance compact excavators in the 6 Metric Ton class that we’ve ever built. The JCB 67c excavator has a JCB Diesel by Kohler common rail Tier 4 final-compliant engine powers these latest 6 Metric Ton machines. By using a DOC, turbocharger and intercooler, we’ve increased power to 51.5hp at just 2200rpm, and there’s also 221.3 lbf ft of torque. A JCB 67c compact excavator offers superb spoil retention during truck loading courtesy of a huge 200° bucket rotation. For total versatility, you can specify your perfect arm length, ranging from 5’5″ – 6’7″. 2 arm options are available for the 67c; 5’5″ and 6’7″ giving increased performance and more versatility. A JCB compact excavator 2-piece boom offers close reach, high digging capacity and excellent dump reach. In order to provide a winning balance of high performance and easy-clean low soil retention, we’ve completely overhauled our compact excavator’s dozer profile and angle. Tapered lift points are located behind the blade edge for their protection. Maximum excavator arm protection is assured during all applications because the JCB 67c compact excavators have a heavy-duty boom cylinder guard, with the option of dipper and crowd ram guards too. The 67c compact excavator benefit from truly premium components like JCB Diesel by Kohler or Perkins engines, Nachi and Bosch-Rexroth hydraulics, and Bridgestone tracks. High quality rubber tracks with interlocking links help the JCB 67c to perform anywhere. Optional 16″/24″ steel tracks are pre-drilled for rubber pads, and you can also choose dedicated Bridgestone GeoGrip Road Liner Pads. Our Below Idle feature means that engine revs are reduced even further when the operator’s armrest is raised. Fuel economy and noise levels are thus reduced. You can programme Auto Idle to activate after your 67c’s controls have been inactive for any period between 2 and 30 seconds. This 6 Metric Ton JCB excavator boast load-sensing hydraulics that only consume power on demand so you save fuel for when you most need it. JCB’s 6 Metric Ton excavator cab is now even more spacious, with storage galore, a phone tray, stowage net and a cup holder. The whole area is accessed easily and safely via a large door. The 67c compact excavators are fitted with a radio, 12V phone charger, powerful heater with window de-froster and a high performing air conditioning system with 9 vents. Graphite impregnated bronze bushes have enabled us to make greasing intervals at the dozer and dig ends of these 6 Metric Ton JCB excavators a best-in-class 500 hours, saving you time and money. Filling your JCB 67c’s fuel tank from ground level is easy with our wide opening steel hood and external diesel indicator. JCB’s optional refueling pump with auto stop function can reduce fuel spillage and increase safety. JCB 67c compact excavator cabs are fully ROPS and TOPS-compliant. Optional boom and cab worklight guards offer protection during hazardous applications; likewise optional boom, dozer and arm hose burst check valves (HBCVs). Large track frame width and a low centre of gravity helps to ensure that stability on the JCB 67c is best-in-class. At JCB, we’ve been building tracked excavators for over 48 years. Our latest 85z and 86c compact excavators are products of all this experience and insight, designed to be robust, strong and durable without compromising performance. JCB’s 85z and 86c are high performance productive compact excavators. Peak power and torque at low engine speeds makes for efficient cycles, and there’s a wealth of innovative design features to get the most from every drop of fuel. A safe site is of paramount importance to any owner; likewise machinery that’s easy and fast to service. Both the 85z and 86c will protect machinery, operators and bystanders alike, as well as providing downtime – minimizing serviceability. Our fully robot welded boom and four-plate arm design are made of high tensile strength steel, with internal baffle plates providing added structural strength for long life durability. These latest 8 Metric Ton class machines boast a heavy-duty swing bracket which features durable re-bushable pivots to optimize service life. It also provides a safe route for all excavator hoses. High quality 18″ rubber tracks with interlocking links will perform in even the most difficult applications. The heavy duty boom cylinder guard provides excellent protection with optional arm and crowd cylinder guards available for more arduous applications. The new 8MT range has a JCB Diesel by Kohler common rail Tier 4 final compliant engine. This boasts DOC, turbocharging and intercooler. Power is increased to 64.4hp at just 2200rpm, and there’s 221.3 lbf ft of torque. This engine doesn’t need a diesel particulate filter (DPF), reducing servicing, increasing uptime and improving fuel efficiency. Tractive effort and 3.11 mph tracking speeds are class leading, ensuring high dozer capabilities and fast travel times. To increase productivity our auto kickdown motors automatically adapt to changes in terrain increasing productivity and reducing operator fatigue. Productivity can be seen to be better with either option, CTS because of the added stability, lifting capacity and larger dig end, or ZTS as the operator does not have to think about what’s around them, which in turn could speed up work, especially in confined spaces. JCB offer both options to suit the customer. A premium closed center pump and valve provides improved flow sharing for smooth, precise and balanced operation during multifunctioning. Versatility is part of the package: our twin auxiliary lines generate both high and optional low hydraulic flows for an array of attachments. The cab is incredibly spacious and its large door provides easy, safe access. Inside, you’ll find 6% more space than before, plenty of storage, a phone tray, stowage nets and cup holder. A radio, 12V phone charger, powerful heater with window de-froster and a high performing air conditioning system with 9 vents completes the picture. The JCB 86c and 85z have excellent front visibility courtesy of a 70/30 front screen split. What’s more, there’s a clear view of the front right track for easy, safe trench digging and maneuvring. Overall we have 11% more visibility than before. With a true zero tailswing design,the 85z reduces impact risks in tight workspaces. For safer lifting operations optional boom, dozer and arm hose burst check valves are available. 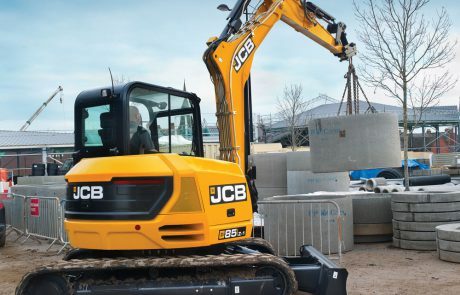 JCB compacts have the best SAE service rating on the market, partly because routine checks can be done easily without special tools and the gas-strutted 30˚ tilting cab. Underneath the wide opening steel hood you can easily fill the fuel tank on a JCB mini from ground level, made easier with the external diesel indicator. The optional refueling pump features an auto stop function for reduced spillage and increased safety. The two piece floor mat is removable for easy cleaning whilst the anti-slip cast tread plate provides safe entry and egress as well as long term protection to the paint bodywork. Our 18″/24″ steel tracks are pre-drilled to allow easy fitment of bolt on rubber pads. There is also the option of dedicated Road Liner Pads (GeoGrip), which enable individual segments to be replaced if damaged. The load-sensing hydraulics on JCB’s 8 Metric Ton excavators only consume power on demand, conserving fuel for when you need it most. A unique feature for even greater fuel economy, the engine rpm automatically drops below idle when the operator’s armrest is lifted and reduces noise level. A simplified H-frame construction and finite element analysis have helped us to create the ultimate heavy-duty compact excavator structure. The JCB 90z and 100c therefore combine durability with confidence-inspiring stability. The fully robot-welded high tensile steel boom and arm is strengthened with internal baffle plates to offer a long and trouble-free service life. For added structural strength, our clean and elegant arm design is constructed from just four plates. With a heavy-duty boom cylinder guard, and the option of arm and crowd ram guards, the JCB 90z and 100c compact excavators enjoy maximum excavator arm protection, even during the toughest jobs. Excavator hoses are safely routed through our heavy-duty swing bracket, which is made to last using durable re-bushable pivots. By using the very latest O-ring face seals (ORFS) throughout the hydraulic system, we’ve reduced potential leaks too. Premium componentry comes as standard on the 90z and 100c compact excavators. The spec list includes JCB Diesel by Kohler engines, Nachi and Bosch-Rexroth hydraulics, and Bridgestone tracks. To help these JCB compacts perform anywhere, they’re equipped with high quality 18″ rubber tracks with interlocking links. Optional 18″/24″ steel tracks are pre-drilled for rubber pads. There’s also the choice of dedicated Road Liner Pads (Bridgestone GeoGrip). 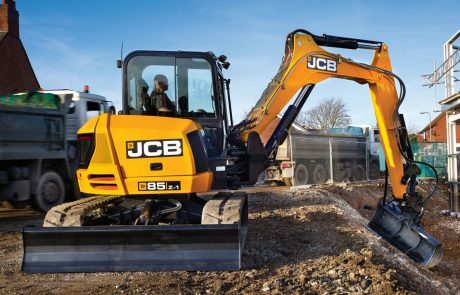 At the heart of these new JCB 10 Metric Ton excavators is a JCB Diesel by Kohler common rail Tier 4 Final-compliant engine that’s fitted with a DOC, turbocharger and intercooler. Power has been increased to 73.8hp at 2000rpm, and the unit produces 225 lbf ft of torque at 1500rpm. You get class-leading tractive effort and tracking speed (2.9 mph with a 90z and 2.7 mph with a 100c) ensuring comprehensive dozer capabilities and swift travel times. To increase productivity and reduce operator fatigue, our auto kickdown motors will automatically adapt to terrain changes. There’s a huge 188° bucket rotation, which helps to provide great spoil retention during truck loading. Both the 90z and 100c midi digger can also be equipped with your choice of dipper length, from 5’5″ – 7’5″. 3 dipper option lengths of 5’5″, 6’11” and 7’5″ gives increased performance and more versatility. Our compact excavator boom is a two-piece unit that offers close reach, superb digging capacity and excellent dump reach. Twin auxiliary lines with both high and optional low hydraulic flows are available on the 90z and 100c, allowing you to operate many versatility-enhancing attachments. Proportional electronic auxiliary line control with full adjustability means you can operate any attachment easily. We’ve completely overhauled our compact excavator’s dozer profile and angle so that performance is improved and soil retention is drastically reduced. Lift points are now tapered and situated behind the edge of the blade for added protection. Fuel combustion in the 90z and 100c compact excavators’ JCB Diesel by Kohler engine is so clean that the unit doesn’t require a diesel particulate filter (DPF). This reduces servicing, increases uptime and improves fuel efficiency. 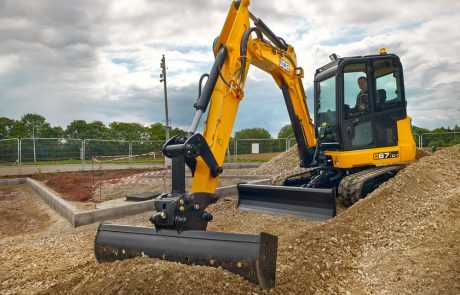 There are two separate dig modes (efficiency-boosting ECO or productivity-enhancing Heavy) on the 90z and 100c compact excavators, allowing you to tweak your performance for any job. By perfectly matching our boom and arm, we’ve created optimal dig end geometry on these JCB machines, helping you to work and load in confined areas with ease. We’ve boosted overall space in our 10 Metric Ton excavator cabs. This means there’s plenty of storage, a cell phone tray, stowage nets and a cup holder. A large door provides easy safe cab access. A 3-speed heater and window de-froster on your 90z or 100c compact excavator with 9-adjustable air vents ensure a comfortable and productive working environment. Front screen guards can be specified, along with boom and cab worklight guards. Optional boom, dozer and arm hose burst check valves (HBCVs) make lifting operations even safer. There’s a clear view of the front right track on both the JCB 90z and 100c compact excavators, courtesy of a 70/30 front screen split. This makes trench digging and maneuvring safer. Bodywork is made using 100% high strength pressed steel so it’s strong, durable and easy to repair. Flat glass windows are used throughout the 90z and 100c excavators because they’re cheaper to replace in the event of on-site damage. For reduced fuel spillage and increased safety, fit your JCB 90z or 100c with the optional refuelling pump with its auto stop function. Excellent SAE service rating on the market equates to greater uptime for both the JCB 90z and 100c compact excavators. Our machines are more serviceable courtesy of features like a gas-strutted 30-degree tilting cab that’s operable without special tools. Straightforward cleaning inside and out is assured on a 90z or 100c compact excavator; the sealed idler tension unit and open frame undercarriage design with sloping track legs prevent material build-up, while the two-piece floor mat is easily removable.